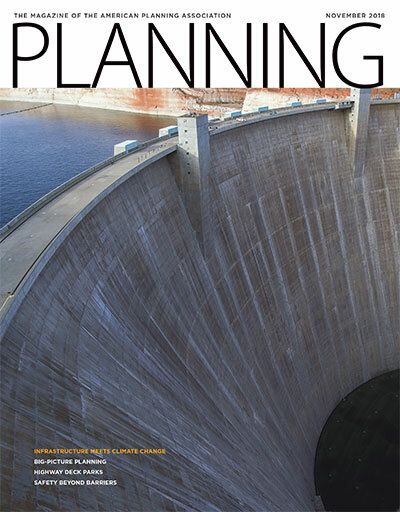 The November issue of Planning highlights American planners' efforts to prepare their communities for 21st-century challenges. In the West, they work with water managers to realign the region's vast network of dams, reservoirs, and irrigation canals with rising temperatures and declining precipitation. Nationwide, planners, architects, and landscape architects integrate good design and protective features in buildings and public spaces that could be targets for crime and violence. Can 20th-century water infrastructure withstand 21st-century climate change? Allen Best looks for answers. Cities across the country are embracing a new era for freeway deck parks. Story by Jeffrey Spivak. Jon Kohl shares a holistic approach to keeping plans off the shelf. The built environment can be a powerful shield against acts of violence. Kristen Pope talks to planners and architects working to create safer public spaces. A guest column by AICP President Glenn Larson. Water and Planning Connect, Policy and Advocacy Conference, Planners' Day on the Hill. How are you celebrating National Community Planning Month? LA River redux, zoning for drilling. Austin's CodeNext, an unexpected road makeover, e-bikes. Reid Ewing reviews the newest Planning Advisory Service Report on autonomous vehicles. Historic preservation, rethinking highways, architecture and regulation. Flickering Treasures, Google Sustainability, forest-friendly resources. Storytelling is a vital component of inclusive planning. Cover: Photo by Alexander Stephens/courtesy Bureau of Reclamation.